I cannot get enough of these pots of metallic heaven! Everyone has been going crazy over the last couple of years or so for the Maybelline Colour Tattoos - and I dont blame them! These pots are worth the hype without a doubt! And if you don't own one... why don't you?! They are a makeup must have! 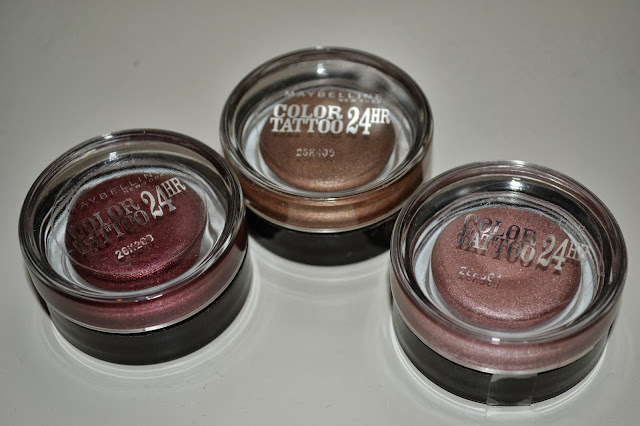 The Maybelline Colour Tattoos are a cream gel eyeshadow and super affordable at just £4.99 each! The formula is highly pigmented, long lasting and totally crease proof (what more could you ask for?!). I apply this product using my ring finger and I usually apply just one layer all over my lid, starting at the inner corner and sweeping it across the lid and I then blend using my ring finger also. If needs be you can use a brush to apply the product, but I find it much easier and quicker to apply this using my fingers and the formula helps to give a super smooth application and finish. Also, you can layer the product to achieve a more vibrant and shimmery look if that is what you desire. I personally dont use a primer with this product as it isn't needed, however if you have oily lids you may want to prime before hand. I love to wear this product during the day as they are perfect if you are in a rush (which I quite often am!) and need a quick fix. 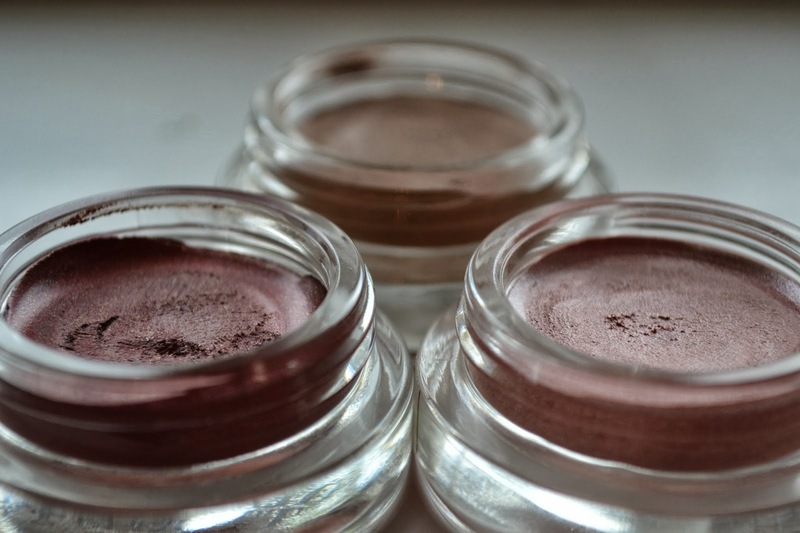 But they can also be worn in the evening and I most always use one as a base for my eyeshadow, if not on its own! The colour range is beautiful - there is most certainly something for everyone. The range of colours is now a lot bigger than it was when these products where first released here in the UK. Most of the cream shadows are metallic, however there is a matte colour - permanent taupe. They claim to have 24hr wear and although I have never worn one for 24hrs, I would say they are very long lasting and I have never needed to reapply during the day. Furthermore, the packaging feels and looks very high-end (transparent glass jar with a screw on black lid) in fact they look very similar to both the MAC Paint pots and Benefits Creaseless cream eyeshadow! Metallic Pomegranate: This is the perfect shade for this autumn/winter! It is a gorgeous deep pomegranate reddened brown, with the most beautiful specks of gold glitter. 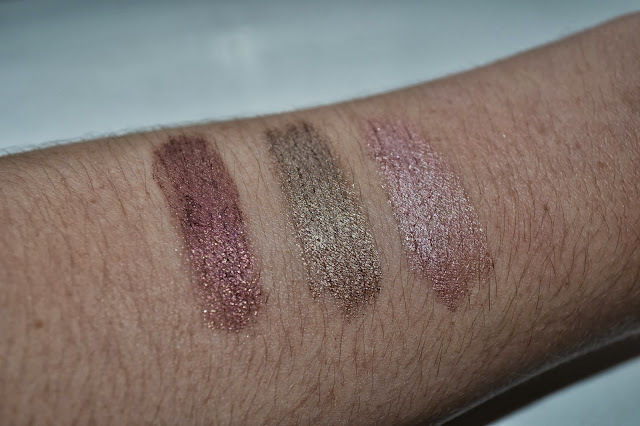 It does remind me of MAC's cranberry eyeshadow but in cream form and out of the three this is most certainly my favourite but a little harder to wear on a daily basis. And On Bronze: This is a fab colour for those with blue eyes - it makes them pop! It is a lovely metallic bronze with no visible flecks of shimmer like metallic pomegranate. I also really like to use this along my lash line as an eyeliner and I often use this as an eyeshadow base. In my opinion everyone should own this shade. Pink Gold: Out of all three of the shades this is the one I wear the least. This of course is a mixture of pink and gold and is very cool toned. However, it does turn a little mauvey when on the skin. I have also used a little of this on my cheeks to add to my blusher and it gives a lovely finish! Boots currently have an offer in store and online for buy 1 get 2nd half price on selected cosmetics and its payday weekend... so if you haven't picked one of these up yet - this is the perfect time! This is without a doubt a must have make-up item in my books! Do you own any of the Maybelline Colour Tattoos? Which one is your favourite?